Home » What to Collect » Open thread: What’s on your weekend agenda? Open thread: What’s on your weekend agenda? What’s on your list for the weekend? Weekend warrior? 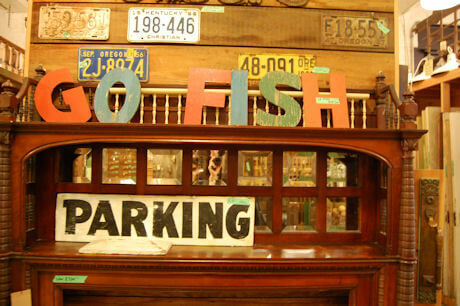 Or goin’ fishin (as in Rejuvenation “salvage art”, above)? I’m doing a major clean of the bathrooms, oh joy. But also, taking my 14-year-old shopping for vintage clothes at Goodwill and Salvation Army — she’s into it now, hurray! Did some ‘Retro Renovation’ on (age 10) Parker’s hair…I gave him a flat-top! Came up with names for Bowling Teams (Family Fun League is two-person teams of one adult and one junior). Parker and I are the Atomic Punks (there was a Van Halen tune). Uniform is apparently to be really loud red and white aloha shirts as we already have a matching pair-and cuffed trousers. Chloe and Laura are now the Bombin’ Bettys (you know, early-60’s surfer slang for a hottie based on Betty Rubble’s physique). Blouses and pleated bowling skirts with bobby sox. Got some flat AWESOME goodies at the second Goodwill we ended up stopping at. We planted our outside planters with trailing rosemary on the hot south side, and dwarf sarcocca (sweet box) in the very deep shade on our west side. The first year we had impatiens but most annuals and perenniels won’t grow there due to the shade and the narrowness of the planters. Cannas would be great and very asian. How about some bamboo? It’s year-round here in Portland, and it’s perfect for a confined space where it can’t get away from you. That is funny because we moved here (well, back here for me) from Portland! Bamboo would be cool! I got two kinds of cannas to put in and those pink/white/green members of the elephant ear family. I am also getting some bigger elephant ears also. I think some bamboo would be a great addition; could block out some of that strong PM sun but the cats/dog (and us) could still look through it. Sara in WA. I live in Vegas (Uncle Jack is a friend and neighbor) and can recommend a couple of wonderful neighborhoods. I live just a bit north and east of the Stratosphere. If you take St. Louis east from the Stratosphere and turn north at Rexford, you’ll be in my 1950s neighborhood. Wander north and east and you’ll keep finding more stuff. Definitely check out Jack’s VeryVintageVegas.com. He can give you more info. Have fun!